What is Blue Buffalo Wilderness Large Breed Dry Dog Food? 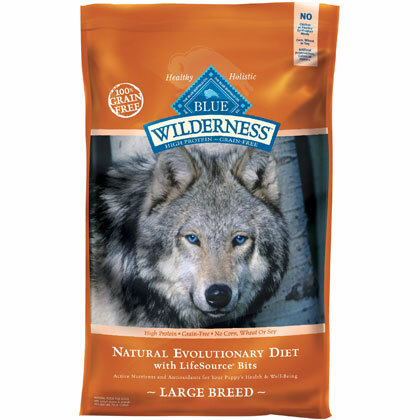 Blue Buffalo Wilderness Large Breed Dog Dry Food is a grain-free, protein-rich food made from wholesome, natural ingredients designed to provide your dog with a diet that closely resembles the natural diet of wolves. Its first ingredient is real chicken, and it is full of vegetables and fruits. Wilderness Large Breed Dog Dry Food is a convenient alternative to raw diets and provides all the nutrients your dog needs for good health, as well as the specific dietary needs required by your large breed dog's size. Works:Blue Buffalo Wilderness Large Breed Dog Dry Food is specially formulated to provide your large-breed dog with the specific nutritional needs required. Blue Buffalo Wilderness Large Breed Dog Dry Food meets these needs with a specific blend of high-quality protein-rich ingredients that come from real meat and all-natural fruits, vegetables, and grains and are free of the preservatives, by-products, and fillers found in many other brands of dog food. It is always important to check the recommended daily feeding charts to ensure you're feeding your pet the proper amount. Overfeeding can lead to obesity and other health related problems, especially in large-breed dogs. Splitting your dog's daily food intake into two separate meals instead of one large meal is recommended for healthy digestion and optimal nutrition. To enhance the flavor and aroma of the dry dog food, add a small amount of warm water and mix well before serving to your dog. Ingredients: Deboned Chicken, Chicken Meal, Turkey Meal, Peas, Tapioca Starch, Chicken Fat (preserved with Mixed Tocopherols and Citric Acid), Tomato Pomace (source of Lycopene), Natural Chicken Flavor, Dried Egg, Potatoes, Flaxseed (source of Omega 3 and 6 Fatty Acids), Alfalfa Meal, Potato Starch, Whole Carrots, Whole Sweet Potatoes, Blueberries, Cranberries, Barley Grass, Dried Parsley, Dried Kelp, Taurine, Yucca Schidigera Extract, L-Carnitine, L-Lysine, Glucosamine Hydrochloride, Chondroitin Sulfate, Turmeric, Oil of Rosemary, Beta Carotene, Vitamin A Supplement, Thiamine Mononitrate (Vitamin B1), Riboflavin (Vitamin B2), Niacin (Vitamin B3), d-Calcium Pantothenate (Vitamin B5), Pyridoxine Hydrochloride (Vitamin B6), Folic Acid (Vitamin B9), Vitamin B12 Supplement, Calcium Ascorbate (source of Vitamin C), Vitamin D3 Supplement, Vitamin E Supplement, Iron Amino Acid Chelate, Zinc Amino Acid Chelate, Manganese Amino Acid Chelate, Copper Amino Acid Chelate, Choline Chloride, Sodium Selenite, Calcium Iodate, Salt, Caramel, Potassium Chloride, Dried Yeast (source of Saccharomyces cerevisiae), Dried Lactobacillus Acidophilus Fermentation Product, Dried Bacillus Subtilis Fermentation Product, Dried Enterococcus Faecium Fermentation Product. Nutrition Statement:BLUE Wilderness Large Breed Chicken Recipe is formulated to meet the nutritional levels established by the AAFCO Dog Food Nutrient Profiles for maintenance. Keep your Wilderness dog food tightly sealed in its original package or store in an airtight container at room temperature for optimum freshness.